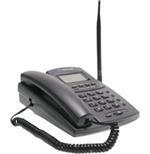 The Telular SX5P Fixed Cellular Desktop Phone is a feature-rich and economical solution for wireline replacement. This user-friendly device provides all the functionality and familiarity of a standard desktop phone, but leverages the existing cellular networks. The SX5P provides excellent voice quality along with robust cellular services to enable a variety of applications to homes, offices, or remote locations. The Telular SX5P Fixed Cellular Desktop Phone operates on CDMA cellular technology and covers the 800 MHz and 1900 MHz frequency bands.